There’s a lot of stuff going down in our little abode … teenage angst and sadness and coming to terms with life and love and things like that. What’s a mom to do? Not a whole lot you can do really. I once read a book by a well-known family therapist that said the best thing a parent can do is make sure the door is always open and there are chocolate chip cookies awaiting. So, that’s what I’m doing – making chocolate peanut butter timbales laced with icing sugar and gold flakes filled with love and understanding and unconditional support. Put the chocolate in a medium sized mixing bowl. In a small saucepan, heat soy milk until it just begins to steam and almost comes to a boil. Pour the soymilk over the chocolate, then add the Kahlua, peanut butter, and vanilla. Let stand for 1 minute, then stir until the mixture is smooth and the chocolate is entirely melted. Sift the flour, powdered sugar, baking soda, cocoa, and salt together into a large bowl. Add the chocolate mixture and stir gently until just combined. Transfer the mixture to a pastry bag without a tip or a resealable plastic bag with one corner snipped off. Pipe the batter into timbale moulds, filling each about 2/3 full. Bake for 15 minutes, until the tops are firm but the inside is still slightly soft (test with a skewer or toothpick, it should come out a bit messy and gooey). Transfer the moulds to a wire rack and let cool for about 5 minutes, then invert the moulds and let the timbales cool completely, about 15 minutes. Dust the timbales with powdered sugar and, if you really want to whoop it up, some gold flakes. Serve with soy ice cream. This recipe is a slightly amended take on Joseph Shuldiner’s Chocolate Tahini Timbales from his new cookbook, Pure Vegan. Filed in What's for Dessert? Breakthrough!!! I’ve found vegan baking a little difficult. It’s been the one transition that’s been harder than the rest. I guess it’s because when you are brought up in a house with a mother, grandmother, aunts, and sisters who are all super-bakers of the egg, butter, and sugar sort, it’s a big shift to coconut oil and xantham gum. 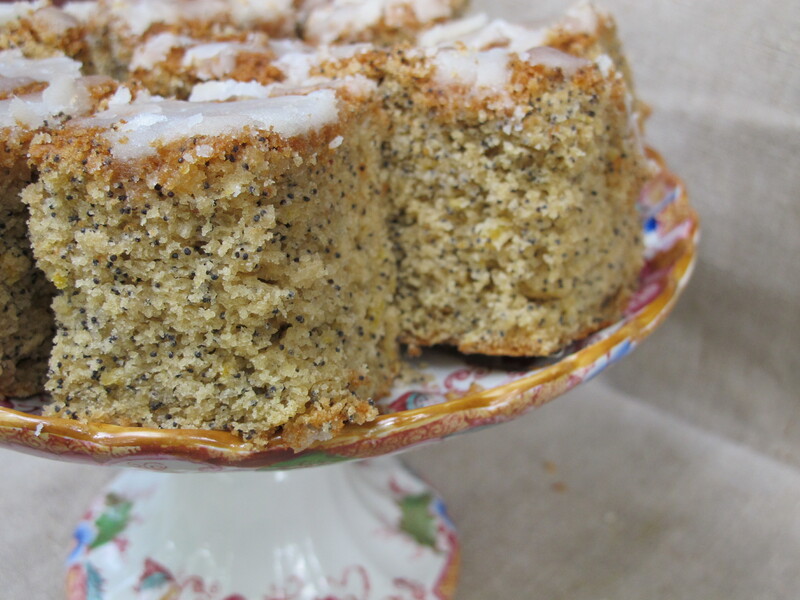 But yesterday I was wanting to make a special cake for a special baby shower and opened up Angelica’s Home Kitchen from the Big Apple and found this fantabulous lemon poppyseed cake. And it worked. And it was delicious. And it was full of super foods like poppyseeds and maple syrup. And I ate it last night as dessert. And I ate it this morning as breakfast. And everyone loves it. Crumbs and all. So mark this day, this 17th day of September 2011, as my v:baking breakthrough day and celebrate by pulling out your mixing bowls. Turn on that oven, get out that loaf pan, and bake away. Preheat the oven to 350 degrees. Lightly brush 8 x 12 baking pan with oil. Add several tablespoons of flour and shake to coat evenly. Invert pans and knock against the counter to rid them of excess flour. Whisk the flour, baking power, baking soda, salt, and poppy seeds together in a medium-size mixing bowl. In a separate bowl, whisk together the lemon and apple juices, maple syrup, oil, vanilla, and zest. Using a wooden spoon, stir the wet mixture into the dry to form a batter. Do not overmix. Transfer batter to the baking pan and bake on the middle rack of the oven for 25 minutes or until a toothpick comes out clean. Cool for 30 minutes before removing. Meanwhile, mix together the super fine sugar and lemon juice. Once cake is removed from the pan, place on a serving dish and drizzle with the lemon sugar icing. Strawberries and cherry tomatoes? Sound like strange bedfellows I know. 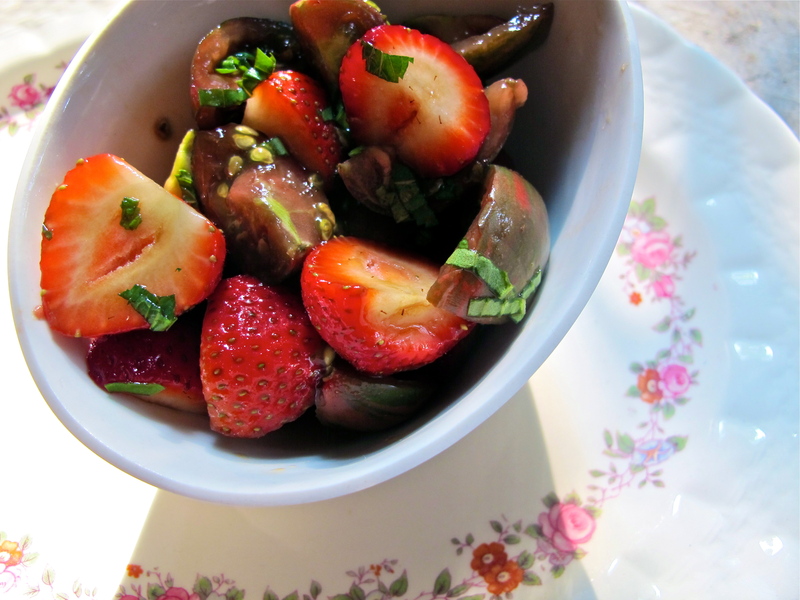 But these two fruits of summer make exquisitely sweet partners in this scrumptious salad. Good for a starter or a dessert, they come together in a marriage bed of mint, basil, and balsamic vinegar. My neighbour, Karen, gave me some of her home-grown violet jasper tomatoes which I used, but experiment with any cherry tomato and take full advantage of summer’s best flavours. Together. Forever. Mix the strawberries and tomatoes together in a bowl. Toss with balsamic vinegar, lemon juice, minced herbs, and pepper. Serve before or after dinner with a nice crisp white wine. Filed in Salads Hot and Cold, What's for Dessert? How much do I love this recipe? Let me count the ways. Number one, pear is an awesome, versatile, sweet (local and sustainable) fruit that should feature prominently on everyone’s weekly menu. Number two, I can’t say enough about cinnamon and ginger. We go through pounds of these two queens of the super spices in our tea, in our favourite tofu marinade, in stews and soups, and just about anything and everything. Number three, who can resist the temptation of carmelized organic cane sugar? (Enough said on that one.) And number four, with a dollop of coconut milk ice cream on the side, you get that hot/cold thing I’ve always loved as the ice cream melts into the sugary syrup. Peel the pears. Cut them in half and scoop out the cores. Place in a small baking dish with the pears packed in tightly. Drizzle the pears with the lemon juice and then sprinkle with the cinnamon, ginger, and nutmeg. In a small heavy-bottom saucepan, heat the sugar over medium-high heat stirring carefully until the sugar melts and turns to golden brown. Drizzle over the pears until they are coated evenly. 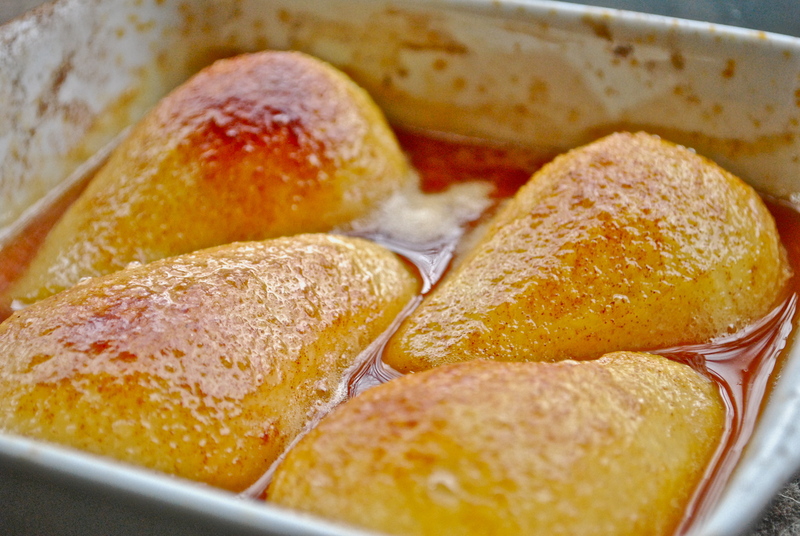 Bake the pears in a preheated oven at 375F for 30 minutes, or until the pears are completely tender. 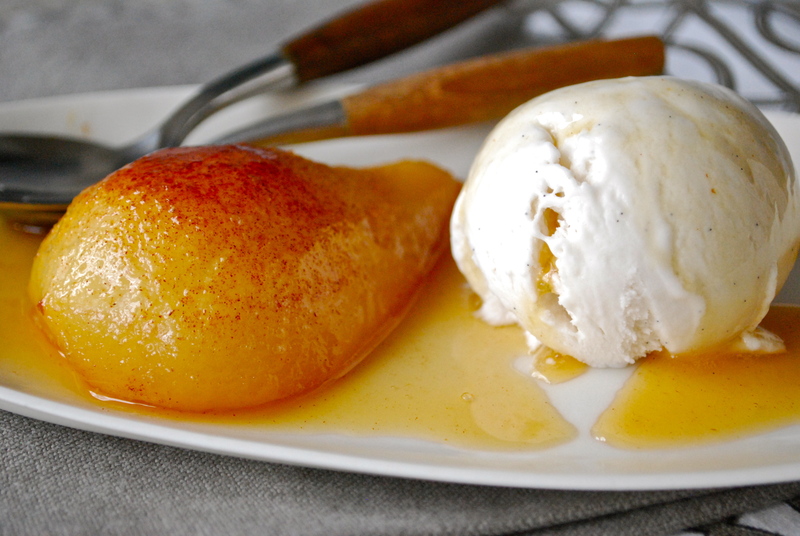 Serve with a dollop of coconut milk ice cream and a generous ladle of the sugary syrup. A friend complained to me the other day that she was stressed out about what to serve her sweetie for Valentine’s Day dessert. Let’s be honest – there are many things you should be doing on Valentine’s Day; stressing about dessert is not one of them. If you want to spend time in the kitchen cooking up a flourless chocolate cake, that’s fabulous. 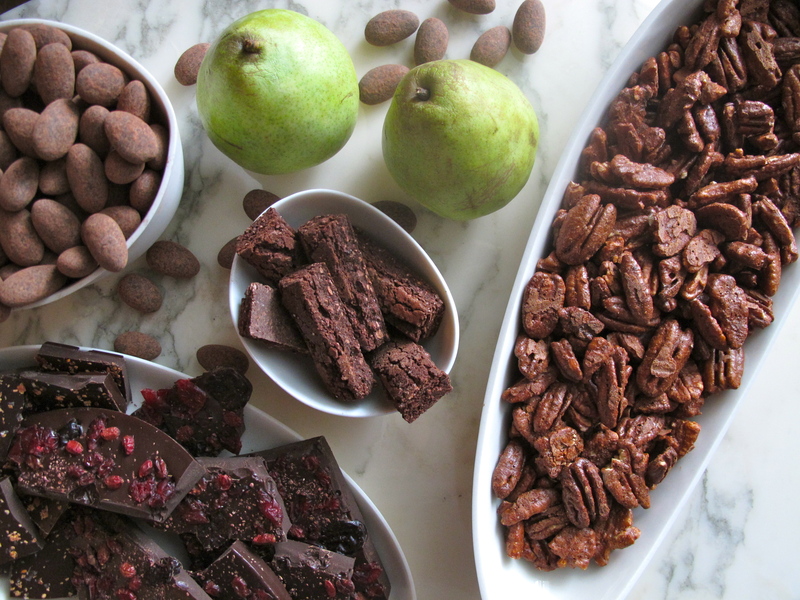 If not, why not put together a carefully curated selection of vegan chocolate, spiced pecans, and sliced pears to savour beside the fire after your Valentine’s Day feast? I get my chocolate from Soma, my favourite chocolatemakers on the planet. Any of their dark chocolate is vegan by its very nature. The tumbled almonds are to die for. The old school chocolate bar has only two ingredients – cocoa nibs and cane sugar. Chocolate as it was back in the day, thousands of years ago. And then there’s always the chocolate with aleppo peppers or maldon salt or wild cherries, barberries, and cranberries. If you don’t have a Soma nearby, check out any of your local chocolate purveyors. You never know, if you ask, you might well receive. Happy v:(alentine’s) Day. Some people say to me “eating vegan day-to-day is hard enough, but what about the holidays?” I say poo-poo to that kind of thinking. With things like this Christmas-y cake full of cinnamon and spice and all things nice like fresh cranberries, apples, and pecans, your holidays will be as festive as ever. This cake will be on my holiday menu for sure – tangy, sweet, and spicy. What better way to say happy mistletoe! Meanwhile, cream the sugar and sunflower oil. Add the flax mixture from the refrigerator and mix well. Add the flour, soda, cinnamon, nutmeg, and salt. Blend together. The mixture will be thick and gooey. This is fine but if it’s too stiff, add a bit of extra water. 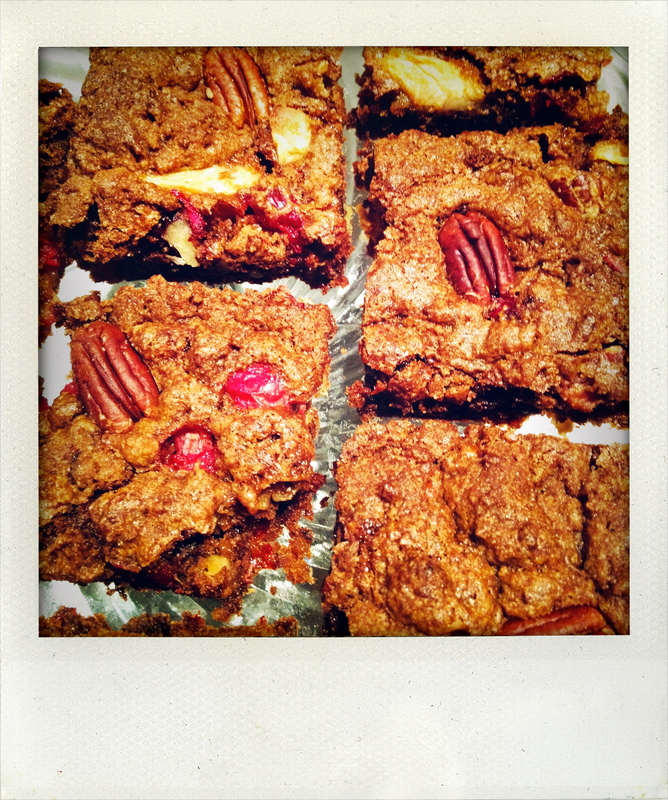 Stir in sliced apples, cranberries, and chopped pecans. Place in a 9 x 13 greased pan and bake for 45 – 50 minutes.